Instituted in 1917. Awarded to all those who had served in France & Belgium between 5th August to 22nd November 1914. Awarded to all those who served in France and Belgium between 5 August and 22 November 1914. In 1919 King George V authorised a clasp bearing these dates for those who had actually been under fire during that period. 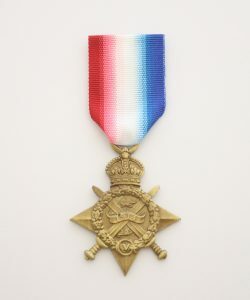 The majority of the 400,000 recipients of the star were officers and the men of the prewar British Army, the “Old Contemptibles” who landed in France soon after the outbreak of the First World War and who took part in the retreat from Mons, hence the popular nickname on the Mons Star by which this medal is often known. Approximately 1000 were awarded to members of the Royal Flying Corps of which about 300 recieved the bar, hence they command a premium. Only a very small number of Australian troops, estimated at just over 20, are entitled to the star as the main force of the Australian volunteers only sailed from Western Australia on 1 November 1914, well into the qualifying period for the 1914 Star. Those who recieved the star were from the Australian Volunteer Hospital Unit who landed in France in August 1914 and remained there untill the end of the war. It is not known if there were any Australian recipients of the star with clasp.